No one likes the bloat. And that’s generally how we all feel come the end of December after overindulging on Christmas pudding and all that chocolate, vowing to go on a crash detoxes and juice-only plans once New Year’s Day comes around. Now, I hate to it break it to you, but these quick-fix schemes never work and it’s easy to fall off the wagon (come on, you knew this already). 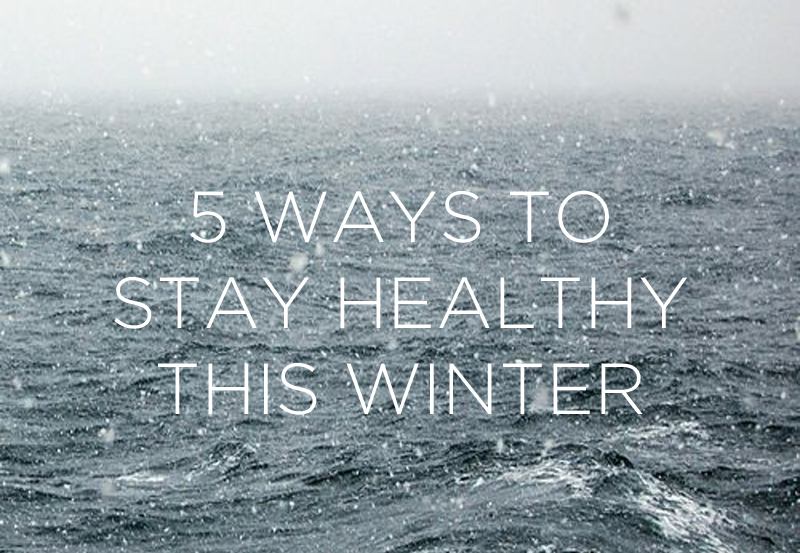 With this in mind, I’ve pulled together a list of five ways to help you stay healthy this winter, which will leave you feeling pretty damn fantastic, so they’ll be no need for any of those unrealistic crash diets in the new year. I know what it’s like. December equals warm drinks in those red cups – hot chocolate with cream, gingerbread lattes (YUM). But don’t forget about your old pal water. I really can’t stress enough how important it is to stay hydrated all year round, but especially when those chilly months creep in. If the thought of drinking water leaves you cold, then try simple ways of increasing your hydration like plain hot water instead of tea or coffee (sounds seriously dull but is actually not that bad), or to make it a bit more interesting, throw some orange and lemon in there. Heck, maybe even a cinnamon stick if you’re feeling wild. Christmas in a mug. Even though it’s cold outside, and you want to stay cosy under the covers, getting out there and keeping active will help you feel virtuous (those endorphins though). The best winter workouts I’ve done in the past, and things I’ll be doing this festive season to make sure I’m continuing to burn fat, are to head to things like bootcamp sessions, gym classes like spinning or Metafit, or parkrun. Group workouts are hugely motivational and will keep you on track. I’m always more likely to give up easily if I’m out say on a long run on a chilly day alone, so get signed up for some group training to kick winter’s arse. Instead of reaching for the Dairy Milk or the tub of Quality Street, try better quality chocolate such as Booja Booja or Ombar to satisfy your sweet tooth. Their higher cacao content will mean you don’t need as much to get that sweet fix and won’t be mindlessly consuming calories. Also, when you do want something a bit naughtier make sure it’s things which are homemade (Christmas Cake, anyone?) and therefore, less processed. Everyone enjoys a celebration and having a few festive beverages is high on many a list at this time of year, so opt for drinks like vodka and soda with fresh lime, or a glass of really good quality red wine, to make sure you’re not drinking your calories and having too much sugar. I always seem to forget about meal prepping at this time of year with all of the festivities going on, so one thing I’m going to make sure I do, especially in December, is to meal prep on the run up to Christmas and get that freezer stocked up too. Meals like lovely warming soups and stews with good sources of protein and loads of green veg will help to keep your immune system in check, and try adding in spices such a ginger and turmeric to boost the flavour and keep any bugs at bay. Were any of these tips helpful for you? How will you be staying healthy this Christmas? Hit me up in the comments below.